Current proposals for the FFMA’s Coffin Accreditation project make it a considerably cheaper option than first thought, association members have been told. Original estimates of the cost to suppliers were around £2,000 per coffin but Richard Barradell of testing, ccertification and auditing group Intertek told FFMA (Funeral Furnishings Manufacturers’ Association) members that streamlining tests would reduce this “significantly”. The project was set up following an increase in reports from crematoria that staff health and safety had been put at risk and the security, dignity and respect owed to the deceased compromised by some coffins. 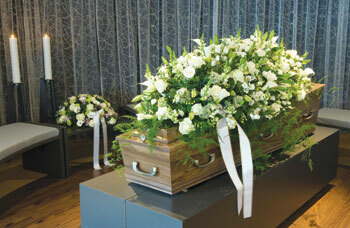 “Cremation authorities and operators – and the bereaved – need complete assurance that each coffin they receive is fit for the purpose of cremation,” said Richard. The main issues of concern are increasing size and weight of coffins, the variety of materials and methods of assembly used and variations in the construction and assembly. An increase in the number of automatic chargers in crematoria and changes in legislation and operating practices are also having an effect. Richard explained that the scheme’s aim is to produce a robust, cost-effective protocol for the testing of coffins, caskets and other materials and to establish a recognisable, uniformed industry standard. The testing programme’s prime objectives are to assess fitness for purpose, performance and safety. The tests will establish the strength of the coffin, the effect of exposure to radiant heat and to quantify and qualify the nature of the resultant ash. And current proposals mean the tests will cost significantly less than original estimates of £2,000 per coffin. Intertek will now apply one test to one example of identical materials and finished products from a supplier, and to the largest example of casket ranges. There are also optional tests, such as on weight-bearing handles, where manufacturers make specific claims. The tests will include assessing the product to ensure it is rigid enough to retain its structural integrity in typical conditions, checking for snagging, jamming or damage and penetration strength, as well as a ‘flash’ test to see if any combustion is likely to occur before the coffin or casket enters the cremator combustion chamber under normal conditions. A combustion or ash/residue test will assess whether combustion leaves adverse residues in the cremator, while the permeability/chemical stability test checks deterioration and staining. Accreditation will mean that the coffin and its attendant components are fit for the purpose of cremation and the coffin will be stamped with an insignia. Cremation authorities and operators have the added assurance that professional indemnity insurance is effectively ‘underwriting’ the accreditation. Richard added that issues were likely to arise and that funeral associations would need to give ongoing advice to their members, and possibly develop specific guidelines. Some issues, added Richard, still require detailed attention including confidentiality agreements for members who submit data. Also, the project overheads – additional to the testing costs – still need quantification and allocation, as does the project’s potential to be rolled out to other countries. A working party, comprising three representatives from the traditional coffin manufacturing sector and three from the alternative coffin manufacturing sector has been proposed to progress of the test schedule, keep costs down, assisting with essential paperwork and liaising with third parties.